My friend Michael Ruffles, who works for The Bangkok Post, has just sent me this link to a wonderful picture story which appeared in the Business Section of yesterday's Post. The link is here. Mr Suttiporn shows some of the typewriters waiting to be fixed in his Klong Tom shop. 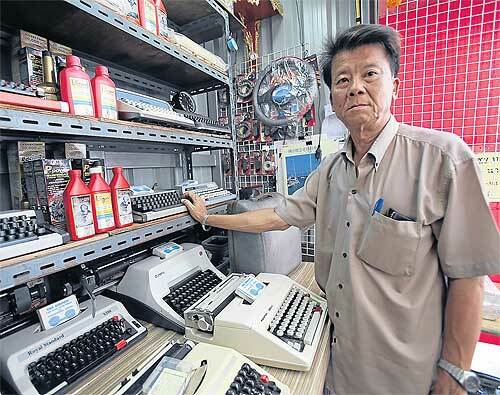 He has worked in the typewriter industry since he was 15.
lifelong seller and repairer Suttiporn Chatviriyatam. The nostalgic clickety-clack of typewriters directs your attention to a 60-year-old gentleman bending over an equally old green Olympia in mint condition. "The quick brown fox jumps over the lazy dog" are the words he typed on a piece of paper while demonstrating the typing to his customers. "That's the only sentence I can type [in English]," he said, smiling. Working in the typewriting industry since he was 15, Suttiporn Chatviriyatam has owned a shop in the busy Klong Tom area near Chinatown for over 10 years. Antique lovers can rejoice that the typewriter has again hit the markets amidst the digital age, where even now you can find step-by-step instructions on how to make a USB typewriter. No companies in Thailand still produce manual typewriters. As more companies switched to computers, many only kept one in the office. Companies like Olympia switched to producing in lower-wage countries such as Brazil, India, Japan and Korea, followed by China. During the 1997 financial crisis, the company Mr Suttiporn worked for closed down. At that time, government agencies froze typewriter purchases. The company sold him typewriter repair tools from Germany to start another career, costing 6000-7000 baht ($US196-$US228) per piece. As his rent is now at least 60,000 baht ($US1958) per year, he cannot make a living by selling typewriters alone. "It's not enough. It's tiring as the economy is bad ... so I have to sell other things as well. My wife has to help me by selling food during weekends," he said. Sales average one typewriter per week. But not all typewriters are saleable. "I need to think about whether [a typewriter sold to him by customers] is fixable, as some cannot be fixed or there are no spare parts," said Mr Suttiporn. "I like antiques. If I had the money, I would set up a building for the display of antiques. Sometimes I even have records for sale." In Thailand the two best-selling brands were Remington from the US and Germany's Olympia, used in government agencies. "Last year, a government agency bought three of my typewriters and ordered another five. Some come to take pictures for auctions and some purchase them for collections," said Mr Suttiporn. Other than government agencies, law firms and banks also use them. Some schools are even using them to train their students how to type. "I do it because it's hard to find a place to purchase these things nowadays. When people see my typewriters, they react as if they have seen gold. Their eyes get big and they get all excited about it," he said. "Once, a 28-year-old from Korat saw the typewriters and was really happy. He bought one for 4500 baht ($US147) to type and show his mother." And Mr Suttiporn's typewriters are lifetime guaranteed - his lifetime, that is. "Customers can come to have their typewriters repaired whenever they want, as long as I am alive," he said. Oh, hello! That's an interesting machine there. Is that.... Oh! What on earth is going on with that keyboard? If I had contact information for Mr. Chatviriyatam's shop, I would be glad to add it to my list of repair shops worldwide. Some repairmen have told me that a listing there has made a noticeable difference in their business. Hi Richard, I was the one who wrote this article. Mr. Suttiporn's number is +66 858466235. However, he does not speak English.